Celebrating 40 years in Music for Bart Willoughby featuring special guests Shauntai Batzke, Phil Bywater, Tjimba Possum Burns, John Miller, Fadil Suna and Sermsah Suri Bin Saad. 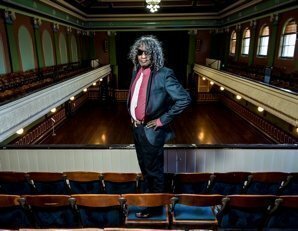 Join Willoughby and guests in the historic Fitzroy Town Hall for a night celebrating his most recent musical compositions and an unnerving 40 years of dedication to his music and his country in the spirit of Reconciliation accompanied by a culturally diverse array of collaborators. Assured Willoughby’s influence was wide spread both locally and internationally. He is interviewed and mentioned in biographies on Peter Tosh and Bob Marley. Willoughby’s distinctive drumming technique can be heard on Aria award winning album Human Love from Colored Stone 1986 and Youth Yindi and at the live recordings on the Diesel and Dust tour through 73 American cities on the Into The Mainstream Documentary, becoming Americas favorite drummer on the1988 tour. In 1990 he formed Mixed Relations and in 1993 was awarded an Inaugural Indigenous Artist Aria Music Lifetime Achievement Award for his contribution to Australian Music. Despite which he has continued to break new ground adding to his list of first recently being the first Indigenous artist to record perform and sing from the Melbourne Town Hall Grand Organ. Following on from his ground breaking Album We Still Live on, Willoughby continued to explore his new found passion for the Pipe Organ experimenting with the Federation Bells with the grandeur of a Natural Amphitheatre recording in The Bungles Bungles with his portable percussive drum box The Wood skin. What began as a musical urge to jam with the birds and the insects inevitably become a profound spiritual journey connecting his Song-lines from S.A to the Kimberly’s. *plus booking fee. Community tickets are limited to limited to 50 for 3CR subscribers/City of Yarra residents/workers and postcode and or subscriber number to be listed on purchase. Event Notes:Community tickets are limited to limited to 50 for 3CR subscribers/City of Yarra residents/workers and postcode and or subscriber number to be listed on purchase.